The Schlieffen plan has often to be said as the ultimate formula for the total victory. A gigantic battle of annihilation would enable the Germans to defeat the French totally and afterwards deal with the Russians without the French in their backs. Despite this propaganda the advance was not a victory-securing manoeuvre, but a “over-daring gamble” (10), for the advance faced many dangers which made its outcome very insecure and doubtful. even worse, every conscious politician had to see that the attack on Belgium would inevitably bring Britain into the war. Astonishing though it seems that Schlieffen’s successor Moltke the Younger was quite aware of this. Recent research seems to show that his intention was not to defeat the French (a task for which he thought the available troops to be inadequate) (11), but to hurt them as badly as possible in order to enable Germany to wear them down in the following stalemate (a fact which for example explains the costly occupation of the Briey-Mines in Lorraine, from whose the French had drawn 85% of their pre-war iron production, and who would have fallen in German hands anyway in case of the Plan’s success) This argument can be supported by the somewhat wavering strategy of Moltke in 1914, who rather sought to gain as much success as possible than to adhere strictly to Schlieffen’s Plan. Furthermore it seems unlikely to assume that all of the German General Staff were so blind to totally ignore the military dangers of a continued advance over 300 miles. So it seems that the Schlieffen Plan was one of the alternatives the OHL pursued in 1914, and who’s aims were a better position for the expected or feared war of attrition. Thus the failure of the Schlieffen plan did hinder Germany from winning the war directly, but it also enabled them to hold out for four years of attrition, which would been impossible if the initial attack had been carried out in the east. The last desperate attempts to force a decision in the West ended after the “Race to the Sea” with even more losses and bloodshed, and all belligerents prepared for the next attempts in spring. Nevertheless the Western front was to be in a deadlock for the next four years, with only minimal gains despite the combined efforts of three of the most industrialised countries of that age. 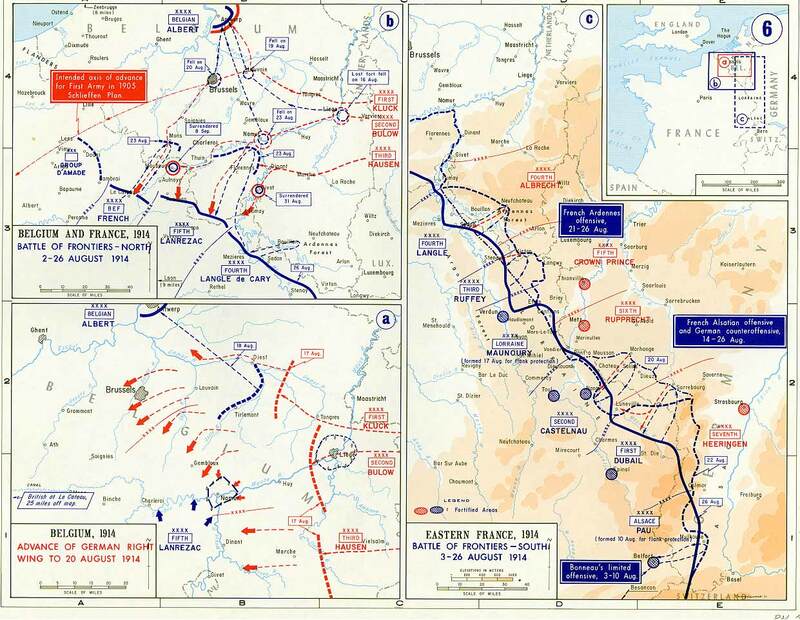 Especially France and Britain committed nearly all of their resources into useless offensives which ought to bring the final breakthrough and the return to mobile warfare. For Germany the situation was to become worse. Exactly what had been foreseen as the ruin of Germany in case of a war, two-front-war and war of attrition, had happened, and now Germany struggled in vain in its attempts to find a way out of the Allied encirclement. The British fleet successfully strangulated the trade of the Middle Powers, and although it took several years the final collapse of Germany is a result of the tightening grasp of the Blockade and the lack of resources. The Germans seem to have hoped that the “good start” they got by occupying the heavy-industrialised northern France would eventually enable them to wear the French down in this war of attrition. And they nearly succeeded. What finally bought the German defeat was the addition of the vast American resources to the allied pool. The Germans, still thinking as well political as geostrategical in the terms of the Europe-centered Nineteenth century, had not recognised the new power and fatally underestimated their possibilities. Nevertheless the Advance continued according to plan, v. Kluck being even two days ahead of his timetable. Around the 29. and 30th it became finally obvious that the right wing had been to much stripped of troops: gaps opened between the First and the Second, later between Second and Third Army. So v. Kluck had to conduct an inward wheeling manoeuvre, which brought him closer to v. Buelows Second Army. This much discussed manoeuvre was the second departure from the Plan, not as much a failure of v. Kluck but a military correct decision forced by the lack of troops. The growing distances from OHL to the Army headquarters made this situation even worse: it was not until the 4th of September that Moltke realised the danger from the assembling French Sixth Army in Paris. The orders given on that evening were issued to late and without the exact knowledge of the position of the troops the were given to. The frontal attacks of the Forth and Fifth Army to capture Verdun and Nancy from the equally strong and in fortified defences sitting French failed. At the same time ( 5th to 8th Sept.) the German right wing was attacked by the British Expeditionary Force (BEF), the French Fifth and Sixth Army. Exhausted from the march and weakened by the detachments it was beaten by the excellent guided French and English troops. The gap between the First and the Second army was still 30 miles wide on the 5th, and the BEF attacked into it and threatened both armies flanks. 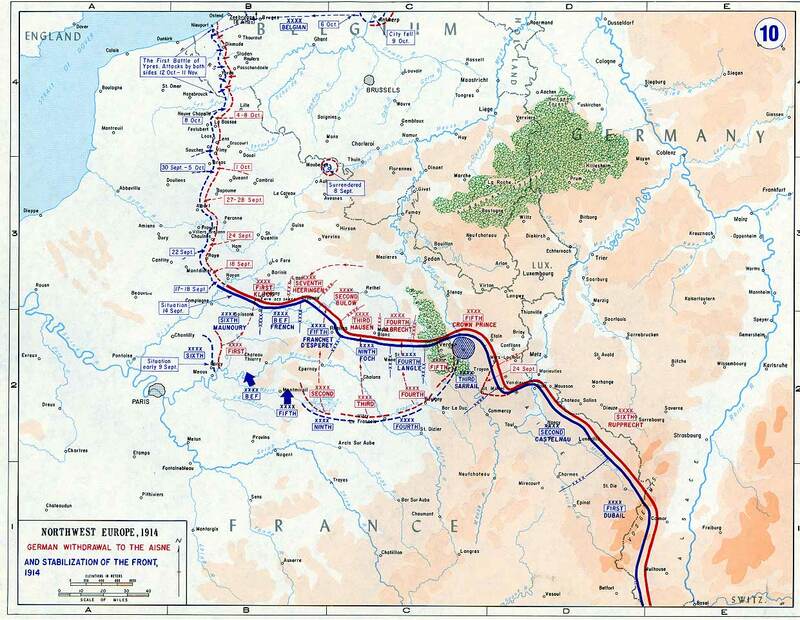 All the OHL could do was to accept the fact that v. Buelow and v. Kluck ordered retreats behind the Aisne on the 8th and 9th of September. 9. Neame, op.cit., p. 26pp. Soon problems arouse. The telephone and wireless, ment to enable the Oberste Heeresleitung (Supreme Army Command, hereafter referred to as OHL) to keep in permanent contact with its armies. But the Belgians cut the wires, allied jamming and disturbances by weather or the failures of the equipment made communications difficult. Although the French didn’t seem to realise the danger they were in from the German armies on their left, the main point of the allied attack was yet unknown to Moltke. Otherwise the German advance continued unhindered. On the 20th Brussels was occupied, the government and King Albert I. had retired together with the army to Antwerpen. 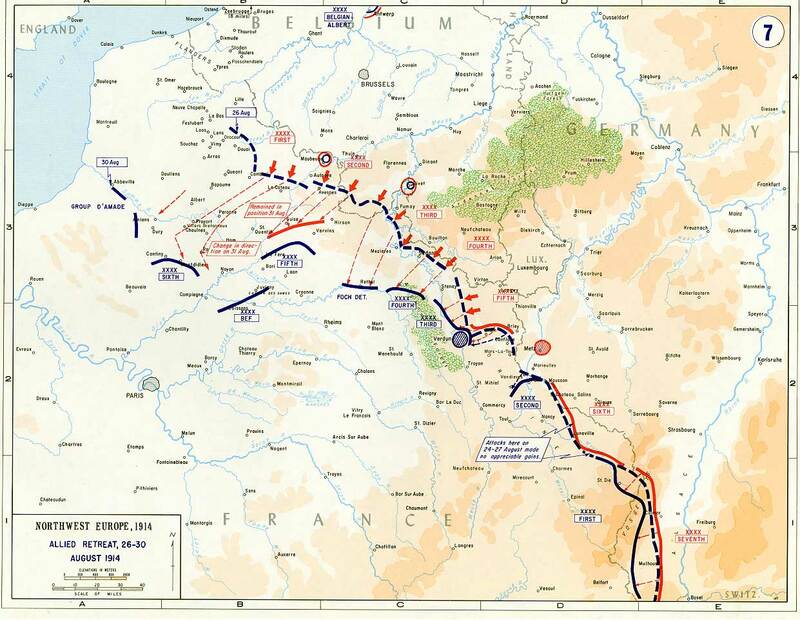 On the following days Foch was ready to realise his Plan XVII, which called for a strong offensive into Loraine. 4. Tuchman, Barbara, August 1914, London 1962, p.189pp. 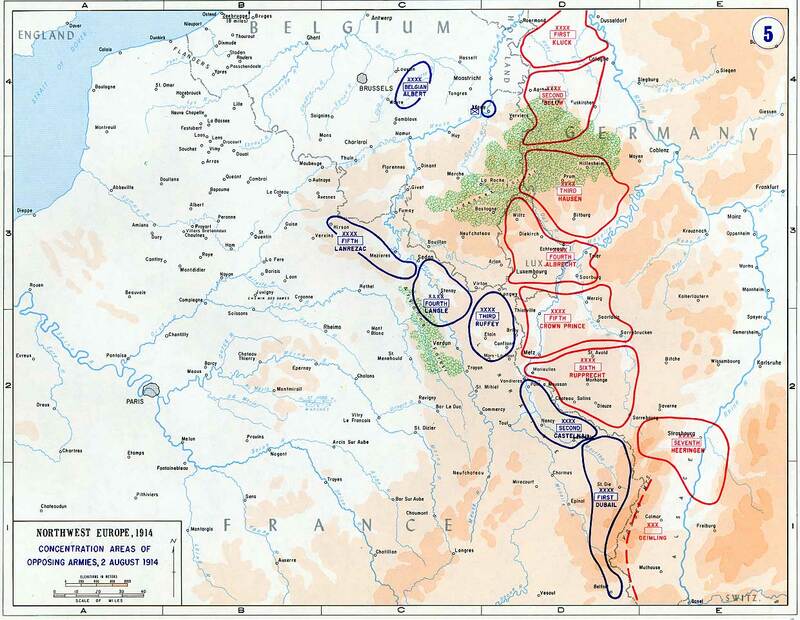 Illustration of the Schlieffen Plan with its wide swing through Belgium and Northern France. Germany’s position in the centre of Europe in connection with long borders which were not protected by natural barriers made its defence more difficult than those of its neighbours. Therefor any commander considering a war against one of Germanys neighbours had to be aware of the danger of either getting drawn into a war of attrition or a two-front-war, both cases being very unfavourable for the Germans, whose geostrategical weakness would usually allow its enemies to cut of the flow of resources from overseas. Thus any plan for a campaign had to seek for a decision within some months, otherwise Germany would face the danger of a long war of attrition that it was likely to loose. After the German Unification the most likely enemies were France and Russia. To escape the disaster of a two-front war the Prussian General Staff decided to attack France with all troops available, leaving only a few divisions guarding the East against a Russian advance. As the French border with Germany was only 200 miles long and had been heavily fortified by the French, and as the French armies grew stronger, both factors ruled out a frontal assault as in 1870. Thus the chief of the General Staff, Count Alfred von Schlieffen, developed the plan to use only a part of the German army to guard the French border and to deliver the main thrust through Belgium. The German troops were to wheel around Verdun and, after encircling Paris and partly bypassing it in the West, to press the French armies against the German border from behind. This manoeuvre would create a sort of “Super-Cannae” and enable the Germans to achieve a quick total victory, which would free troops for the eastern theatre. To fulfil this task detailed plans were created when and at which day of mobilisation what corps had to take which city, and a gigantic plan of railroad transports to secure the accurate development was pinned down. 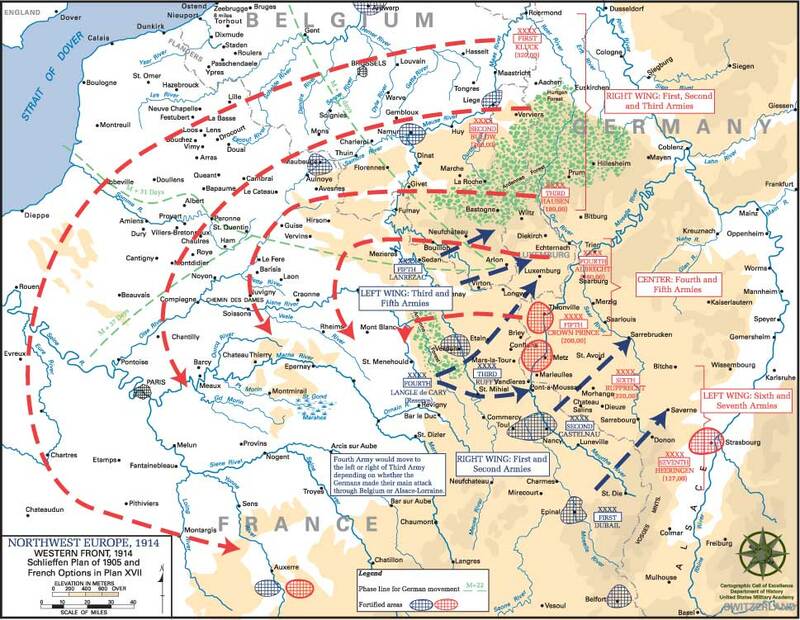 The Schlieffen Plan has much been criticised for its detailed orders, which preplanned the moves of virtually all corps right to the decision of the battle, thus leaving virtually no time for Clausewitz “friction” or even contrary orders by the CiC. Every departing from the original development bare within it the danger of failure. This plan was finished in 1905 and only slightly modified by Schlieffens successor Moltke the Younger, the nephew of the older Moltke who defeated Austria and France. But these modifications proved to be crucial. 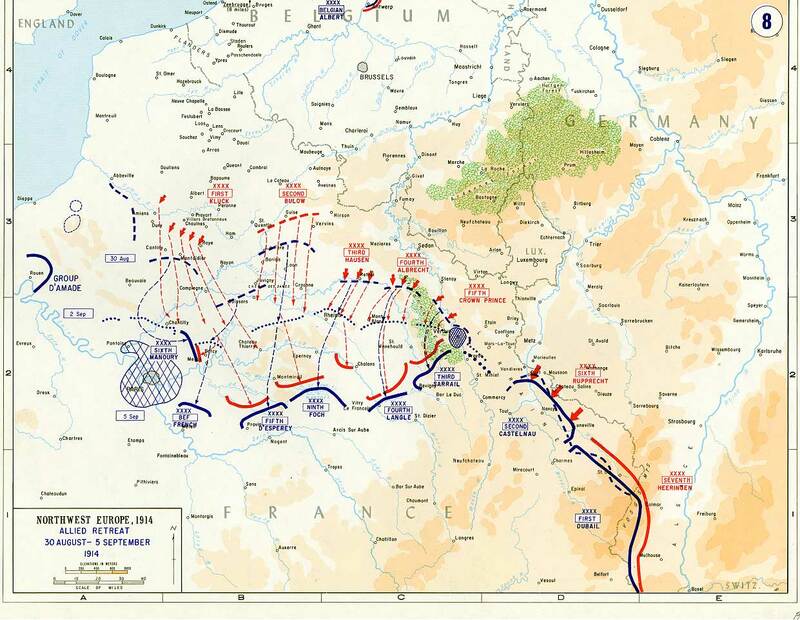 Schlieffen had stripped the left wing, who was to engage and pin down the mass of the French army, down to 7 Divisions, whereas the right wing was to consist out of 54 Divisions. Moltke used the additional Divisions he gained in the period from 1905-14 to strengthen the left wing and to assemble a reserve of six new Divisions. This alone did not much to hamper with Schlieffen’s plan, but the addition of failures in leadership in the early stages of the war led to a disaster. Happy New Year to whoever may read this :-) Haven’t been able to care for the Generalstab for quite a while, and any improvements in navigation are still only a couple of scribbled notes on my table here. However, we’ve got a new game up and running in the Kriegsarchiv, Brian O’Connell returns to Spain in an attempt to overthrow the Loyalist government… have a look.